Mommy and Daddy might have to call Cesar Millan “the Dog Whisperer” or Victoria Stilwell of “Its Me or the Dog”. Preston used to be a sweet and easy-going puppy that never showed his teeth unless it was to defend himself. As Preston got older, he is turning into a grumpy dog. He still plays well with other dogs in the park but has become very protective of his toys and started showing food aggression when another dog is around. This has been giving Mommy and Daddy a big headache. Not too long after Preston moved to Houston, he met up with his cyber friend, Puggles. (Interesting name, huh? 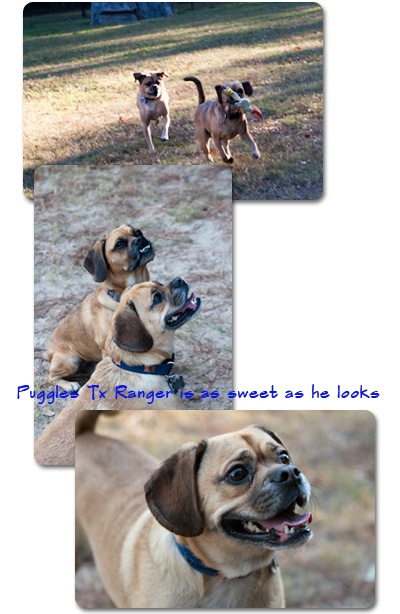 His full name is Puggles TX Ranger) The two boys had a great time at the dog park. They played chase and shared treats together. 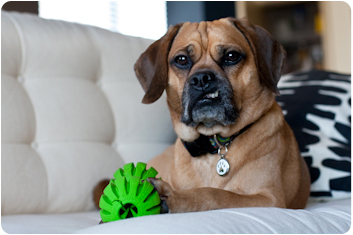 Puggles is the sweetest boy and has great temperament. A couple of weeks ago, Puggles invited Preston over to check out his house because when Mommy and Daddy are going on vacation, Puggles and his parents will be looking after Preston. 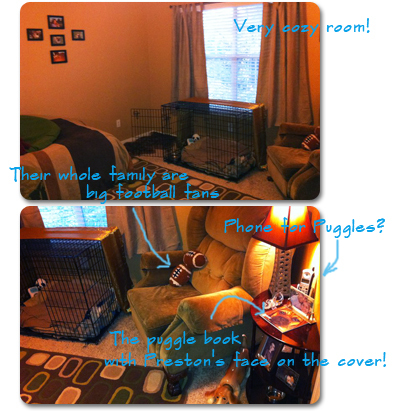 Puggles’ parents would like Preston to get familiar with their house before the sleep-over. How thoughtful! Mommy and Daddy are so grateful for their help. Mommy really thought Preston had just lost a friend but before Mommy and Daddy took Preston home (with huge embarrassment! 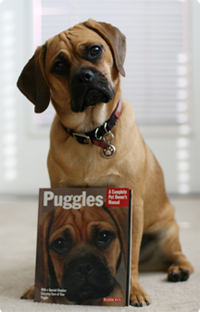 ), Puggles walked to Preston cautiously, sniffed a little and wagged his tail again. The two of them made up and were friends again. Puggles is truely the sweetest puggle. What should Mommy and Daddy do about Preston’s agressive behavior? He doesn’t do that to people (thank goodness!). When Bunbun the Havanese slept over, Mommy kept close eyes on them during dinner time. Preston wasn’t aggressive towards Bunbun even when she tried to stick her head in Preston’s bowl when he was eating. Preston is very unpredictable. This has made correcting his behavior harder. Mommy and Daddy are going on vacation this weekend. Puggles and his parents are so kind and still welcome Preston to their home even after they found Preston is such a bully. Puggles’ mommy and daddy will make sure to keep both boys safe. Preston is so lucky to have a friend like Puggles. Puggles is very well-loved at his home. He even has his very own room, decorated just for him. This is a popular human recipe but since kale is a highly nutritious vegetable that is rich in anti-oxidants, Mommy is happy to share this tasty and healthy snack with Preston. If you are not a big fan of kale (like Mommy), you will be surprised how yummy the crispy kale is. There are many recipes of crispy kale online. Mommy’s recipe is based on one of her favorite food blogs: SteamyKitchen-Baked Crispy Kale. 5 cups of leafy kale, torn into bite-sized pieces, thick stems removed. 3. Drizzle olive oil over the kale and toss with your hands until all surfaces are coated. 5. 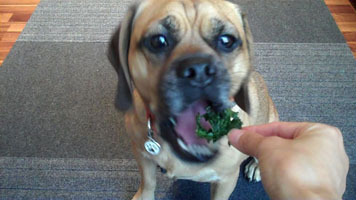 Save some unseasoned crispy kale for your pooch! Sprinkle the remaining crispy kale with salt/seasoning salt. Honk if you see a “PUGGLE”! 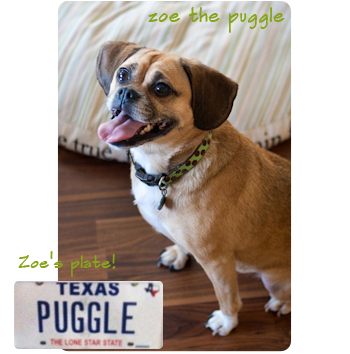 Mommy and Daddy’s obsession with the PUGGLE license plates started when they first got Preston in California. 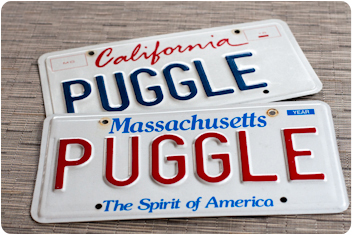 They snatched Massachusetts’ “PUGGLE” plate as soon as they moved to Boston. 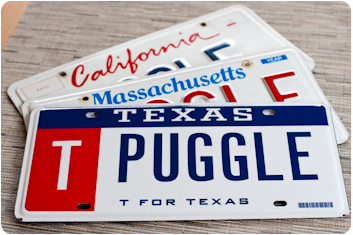 One of the first things Mommy looked up after Daddy decided to accept a job offer in Houston was the availability of Texas’ “PUGGLE” plate. They were heart broken when they found out Texas “PUGGLE” plate was taken!! Just as they were trying to find an alternative plate, Pugle or Pu99le? Texas gave drivers a second chance to use words that have been taken by releasing the “T for Texas” Plates. Mommy and Daddy were thrilled they could have a PUGGLE plate on their car again! Long before Preston moved to Houston, he already had some cyber friends in Houston. Once Preston settled in his new city, he couldn’t wait to meet up with these wonderful cyber friends. One of them was Zoe the Puggle. When Zoe’s mom, Ginger read Preston also lived very close to Danny Jackson Bark Park, she and Mommy immediately set up a playdate. Here is what Ginger wrote Mommy after she found out where Preston’s apartment was, “All these years we’ve been following Preston’s blog, and you guys move literally…..right around the corner!” Yes! Preston’s apartment complex and Zoe’s were literally back to back neighbors!! What a small world! Mommy and Daddy would like to thank Preston for another year full of joy, love and laughter.